Leading the way in IP/Network camera technology with a full solution offering, Panasonic’s network Pan/Tilt/Zoom & Static dome cameras are feature full. Delivering 1080p full HD image quality day and night, in all conditions, the range is optimized with vandal resistant housing and features multiple H.264 and JPEG streams, face detection, and MEGA super dynamic technology for a wider dynamic range. 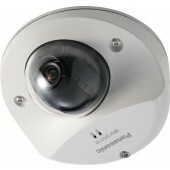 Super Dynamic HD Vandal Resistant Dome Network Camera. Multiple H.264 (High profile) streams and JPEG streams. 2.8 mm (1/8 inches) Lens. HLC (High Light Compensation). Fog compensation function. PoE only.